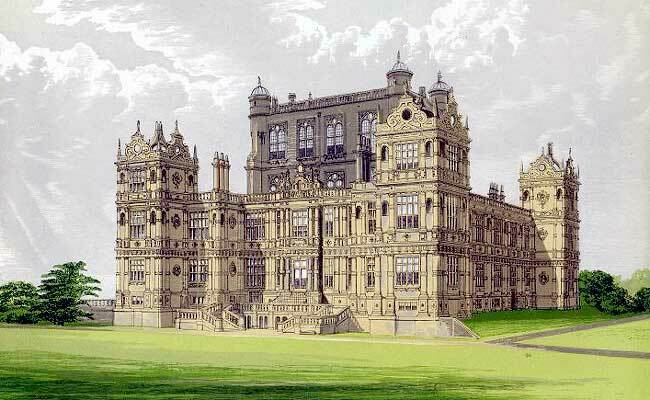 At the request of our Council, Lord Middleton kindly gave permission to members of the Thoroton Society, to visit Wollaton Hall, on Tuesday September the ioth, 1912. Lord and Lady Middleton regretted that they would not be in residence at the time, but they very kindly arranged that those members who attended should have tea at the Hall. About eighty members joined the excursion, and Mr. J. A. Gotch, F.S.A., spoke from the terrace on "The Architecture of the Hall," the following being a summary of the account he gave. Readers who wish for a more detailed description are referred to a paper by Mr. Gotch, recently published in "Memorials of Old Notts.," edited by E. L. Guilford. Inchoatae 1580 et finitae 1588." From a collection of plans in the Soane Museum, and another collection belonging to Col. Coke, together with the Smythson monument in Wollaton Church and Cassandra Willoughby's account of the house in 1702, it may be very reasonably inferred that John Thorpe was the designer of the plan and elevation, and that the work was carried out by Robert Smythson with the help of a few master-workmen brought from Italy. The plan of the house is foreign in origin, but was worked out in compliance with English ideas and habits. In order that the entrance to the hall might be by way of the screens, and the kitchen and servants' rooms exceptionally placed in the basement, Thorpe kept his hall floor level about that of his front door. The central hall is over fifty feet high, with its window sills above the roofs of the surrounding rooms. The Elizabethan character of the interior has been wiped out by modern alterations with the exception of what remains in the basement and in the great hall. In the latter the original stone screen is still left; the roof also is left and is a fine example of the period. According to Cassandra Willoughby's account the house cost £80,000 apart from the stone brought by pack horses from Ancaster and exchanged for coal. Externally, the house is classical in character, with pilasters, gondola rings, cornices, and circular niches containing busts of Pluto, Aristotle, Virgil, and others. Mr. Gotch thinks that the building accounts would prove that Holland rather than Italy was the source of some of the lower work "as it is almost certainly the place where the curly gables of the pavilions had their origin." In the second half of the 16th century, and first half of the 17th century, there were several groups of men in this country influenced by Italian ideas. Among others were the Thorpes, father and son, several generations of the Smythsons, and Inigo Jones and his pupils, who, from Venice, introduced the Palladian style into England. Mr. G. Fellows next took the visitors round the house and pointed out to them the objects of interest, family portraits, and other pictures, giving a few details respecting each.